The Wider Image: Life on the streets of L.A.
LOS ANGELES (Reuters) - As Los Angeles grapples with a huge homelessness problem, El Nino weather patterns are likely to bring torrential downpours in coming months and add to the misery of the thousands of people who sleep on the city's streets. "It is a crisis in LA, and I don't think people realize the magnitude of it," said John Kump, an outreach program manager at the charity People Assisting the Homeless (PATH). Los Angeles' homeless population is estimated at about 44,000, with many of them concentrated in a bleak and chaotic square-mile patch of downtown known as Skid Row. The others can be seen across the sprawling metropolis of some 10 million people, sheltering under highway overpasses and on vacant lots in ragged tent encampments, and in cars and campers lining streets. The number of makeshift tents and vehicles used by the homeless has shot up by 85 percent in just the last two years to 9,535, according to the Los Angeles Homeless Services Authority, an independent agency set up by the city and the county. Mayor Eric Garcetti proposed in September spending $100 million to combat the problem. But he stopped short of declaring a state of emergency that would lift barriers to housing people, or calling on the governor and federal government for funding. Last month, the city council gave initial approval to a plan to shelter the homeless in public buildings and to allow people living in cars to stay overnight in designated parking lots. But many homeless are reluctant to leave possessions and pets on the streets in exchange for a short night of shelter. The health and meager belongings of the homeless will be even more at risk when the expected rainstorms begin, advocates say. The last two El Ninos, in the winters of 1982-83 and 1997-98, each walloped Los Angeles with more than 30 inches (76 cm) of rain - double the amount that the city normally receives each year - according to William Patzert, a climatologist at NASA's Jet Propulsion Laboratory near Pasadena. 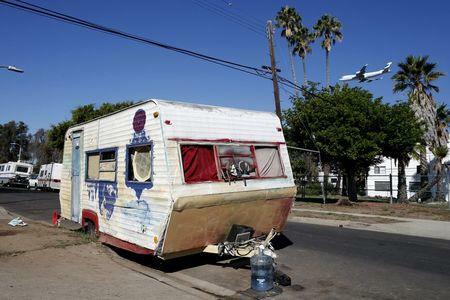 Gary Blasi, professor of law emeritus at UCLA, wrote in a Los Angeles Times op-ed article last month that many homeless people could die if a state of emergency is not declared that could ensure some short-term housing solutions. The homeless desperately need pallets to raise their tents off the sidewalks, he wrote, as well as heavy-duty tarpaulins, toilets, trash collection, and portable showers. Blasi also called for the repeal of a ruling that makes it a crime for homeless people in Los Angeles to refuse to break down tents on sidewalks during the day. 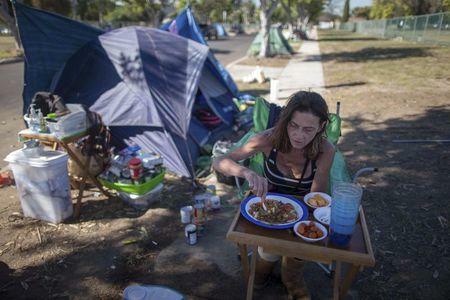 Even as American cities grapple with a chronic shortage of affordable housing, as well as budget constraints on social programs, many municipalities across the United States have also been clamping down on homeless encampments. Los Angeles residents pay a higher percentage of their income in rent than any other U.S. city, according to a UCLA study last year. 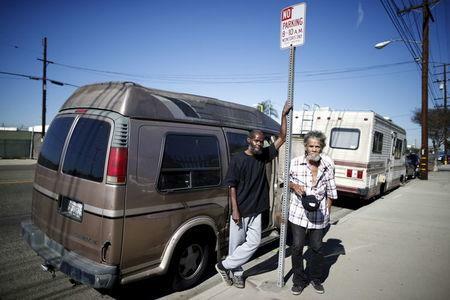 For the thousands in Los Angeles who live in their cars, they may have a roof of sorts over their heads, but basic needs go unmet. Retired trucker Samuel Cole, 85, has lived in a camper for the past two years after his landlord raised the rent by $100. Vandals broke his generator, so he no longer has electricity. Like so many others, he said that a lack of running water is one of his biggest problems. "I just have to wash off best I can," Cole said. "Very difficult."